Why is there so much wrong data about NGA? 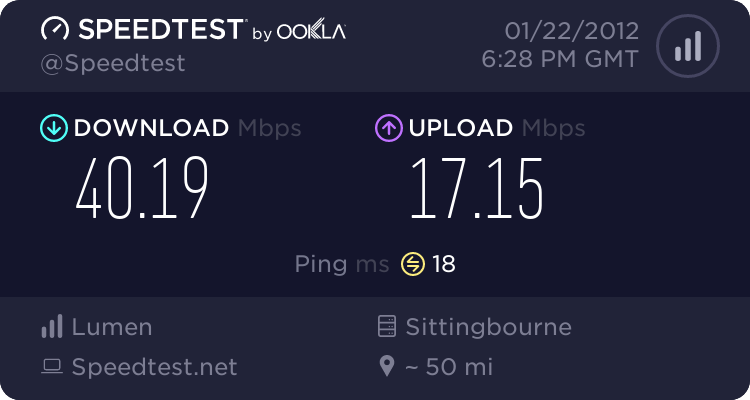 BT estimates this West Sussex dial-up line will get a "typical line speed" of between 750kbps and 2.5Mbps. It presently gets 40kbps. A reader in the (fixed line, pax, Kijoma) broadband-starved county of West Sussex has just sent us this screenshot. It shows that BT estimates the dial-up line in question will get a “typical line speed” of between 750kbps and 2.5Mbps if the subscriber upgrades to broadband. Our reader says previous correspondence with BT revealed that the a line length of “8.5-9km/DB losses of between 82 and 86 DB”, which probably makes it impossible to achieve those speeds. “I am most impressed with the BET they are obviously going to employ here!” he writes. This is not the only flawed data that BDUK or even Ofcom might hold. Bill Lewis of Kijoma has been fighting to have his wireless broadband footprint included in the coverage maps – to no avail. Kijoma provides high speed broadband to parts of West Sussex, including areas served by three of the four BT exchanges in the UK that cannot deliver broadband. West Sussex County Council’s map of the area do not show Kijoma’s footprint. Everybody involved the the next generation broadband project, including BT, is on record saying that there needs to be a mix of technologies, including wireless, in the local access loop. Why then are existing wireless providers being ignored? Why do the maps not reflect truly what’s available? What other incorrect data are being used to support claims to £530m of taxpayers’ money? Enough people have raised the incorrect data issue with BDUK, DCMS, Ofcom and the government that for them to ignore it is wilful. We must ask why. Would it shrink the areas eligible for state-aided funding? If so, in whose interest is that? I have been having this debate with BT since 2003. The BT checker shows many properties round here as being able to get a service. Despite buying modems and paying for connections and despite numerous visits from engineers who have confirmed there isn’t a hope in hell of getting a connection the same information stays on the checker. Presumably this is where the toothless regulator gets its information from. Just because a house is on an enabled exchange this does not mean it can get broadband. I am glad you have brought this up on your blog, and I hope somebody does something about it. Millions get a really poor connection or none at all, and BT and Ofcom go sailing on spreading mis-information and laughing at all the eejits who fall for the hype. The worse culprits are the funders, who believe it all. Sad old digital britain. Looking at SamKnows for West Chilington the longest distance looks like 3.5km. Only a few roads. Strange. Time for a national database for every postcode showing accurate availability of broadband, gas, electric etc. Here’s the link to what SamKnows about West Chiltington. http://www.samknows.com/broadband/exchange/SDWSTCH. It notes that Kijoma is “activated”, but otherwise BT has no competition. What speed does Kijoma actually deliver in West Sussex ? Is it the “up to” 13 megs on the website for Silchester area ? If so what does that mean in practice ? There are two separate points here – and both are valid – but both are also double edged. 1) State Aid – I believe we need to stop trying to claim “market failure” and instead deliver support to disavantaged areas via local authority economic development, planning gain and public service delivery contracts which are subject to open and competitive procurement – e.g. to deliver a gigabyte (i.e requires a fibre connection) to the post office, surgery, community centre or school and 10 megs (rising to 100 over time) to enable telemedicine, out of hours care, inter-active homework etc to every pensioner or pupil. 2) Incorrect and misleading data – even when the lines are tested the nominal speed may be very different to that delivered. One of my lines was supposedly running at 18 megs but delivering barely 1.2 because of belts of interference. 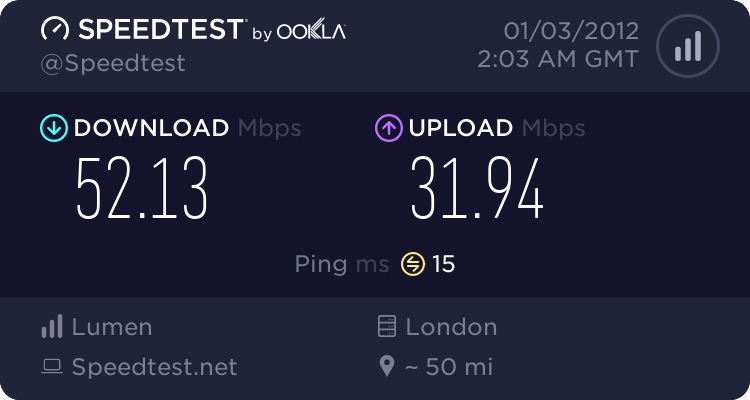 After four hours of work between my home and the cabinet and between the cabinet and the exchange, plus replacing the router – it was delivering just over 17 megs. We need quality of service data based on remote polling. You should address the Kijoma speed question to Bill Lewis, who runs Kijoma (see his comment here too). Bill, perhaps you could let us know here too. On the state aid issue, I’m not sure who the “we” are who are claiming market failure, or indeed what a disadvantaged area might be. As noted elsewhere on this blog, large parts of East Sussex for example have house prices eight to nine times the average resident’s income. However I do agree with your main point, which, as I see see it, says, specify the speeds, latencies and other Quality of Service issues – stuff that you can measure accurately, and let suppliers compete on that basis. Which is OK for public procurements, but do you then allow public access to the public service network, to save duplication of resource, alternatively paying the supplier twice for the same infrastructure? Regarding the inaccurate data, you probably know that SamKnows has a European Commission contract to audit broadband speeds on behalf of Nellie Kroes’s Digital Agenda initiative. I think we can all look forward to seeing its methodology and the results it produces. BTW I have asked SamKnows a couple of questions about where it sources its data, how often it is refreshed, etc. If I get a reply I’ll post it here. Excellent article Ian 🙂 , you beat me to sending you the WSCC website blurb, it is sad to see they are continuing to ignore the service we provide , especially in the three exchange areas with no “ADSL”. If you would like to do a tour of these places, check customer speeds , blog it/stick it on video etc.. then do say , i am sure we can make time here. The comment abnout Samknows and West Chiltington, you need to remember that West Chiltington does not have an exchange as such. all lines are routed back to Storrington. I would be interested to the address / post code if the West Chiltington address mentioned in the article, mainly to see if we already cover them, if so then they have an alternative option to explore! 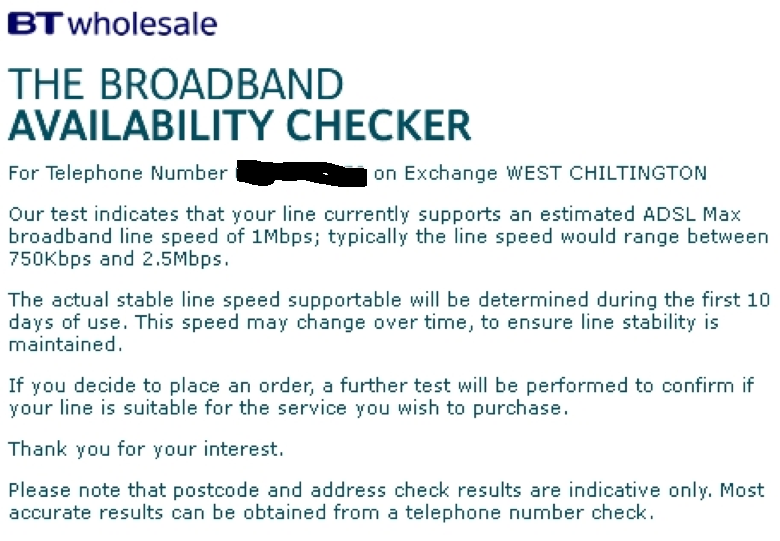 You would be interested to know that Kijoma first looked at providing broadband to West Chiltington in 2003, shortly after leaflet dropping the BT status changed from “unviable, not enough people using dial up to even warrant it” to viable. This was due to a local campaign and a rumoured BT official resident who was less than impressed at the idea of having a competitive service to BT in the village. More recently we tried to gain sufficient demand from West Chiltington as some parts need us to put up a new relay and the cost has to be justified after all. We joined the WC forum and posted a message outlining what we offer. The response was to receive abuse from the forum owner and my response and his were promptly deleted by him and my account removed from the forum. After this the big “infinity” driver occured and over 500 people in WC registered for it and the had the wonderous support of Nick Herbert MP (Of broadband summit, never respond to emails fame) .. So far we have about 10 people who would need the new relay registered on our enquiry system. This is insufficient to warrant the cost. Meanwhile many people in WC area (Gay street , Broadford bridge, upper Nutbourne lane, North heath) who have Kijoma capability are happily connected to Kijoma and many have been for over 4 years. WC also have on their website and forum a drive to put in their own wireless system and not a single positive mention of Kijoma. With this backdrop I find it difficult to empathise with WC’s plight when a lot of it is of their own making it seems. Threads like this > http://www.westchiltington.com/forum/viewtopic.php?f=10&t=67 only got to clarify this. This looks like you are falling into the common thinking that if a provider offers “X Mbps” than that is a physical limitation. This of course comes from a long history of experience with ADSL and any line based system (excluding pure fibre) whereby the speed is defined by the “last mile” to your property. With Kijoma we are fed from Data Centres who have hundreds of Gbits/sec of capacity across multiple redundant providers available for us to purchase . As you may be aware capacity is sold per Mbit/sec , not Mbytes transferred. This means ISP’s have to balance the capacity they pay for with the customer base they feed. Many of the “stack em high, sell em cheap” ones will buy limited capacity and cram as many as possible onto it. Their thinking , which makes sense if your only objective is income, is that if the capacity paid for isn’t at the red line for most of the time then they are buying too much. The result is providers with services that drop to a crawl at peak times who very quickly instigate traffic management to throttle anybody who they consider is using more than the majority (even if they are well within their package limits). Kijoma offers speeds which are based on a balance between our capacity and its cost, the revenue we gain from customers and the finite limitations of the various technologies. It does not mean that “up to 16 Mbps” means that there is 16 Mbps shared across a load of people, that is wholly inaccurate rubbish. The customer service speed is set by a queue, each customer has their own queue and there is a mixture of RED/SFQ QoS with differing priority for different tariffs applied to these. The priority system means higher tariffs have priority over lower ones if a contention issue were to exist. We do not have any protocol or net service specific “management” in place, unless of course you include VoIP in this. Yes it was done at night, as the point was to show that our technology/system is not the limiting factor to end customer service speed. In West Sussex we have two networks, I am connected to the largest of the two and my location is three radio “hops” away from the server over a total wireless distance of about 60 km. We are able to offer mainstream comparable prices in West sussex mainly because of the infrastructure model we use. We have no reliance on Leased lines/ethernet or any middle men like “openreach”. Many Wireless providers use a different model. They put in a 100 Mbps “last mile” fibre/ethernet line locally, usually over openreach infrastructure and pay the considerable costs of this. Then from this they distribute at a local level. In some areas we may have to do this in the future too if there are no Data Centres about we can link to. When they activate a new area , they put in another “leased line” and repeat. This makes it easier for the wireless side but a lot more expensive to run, hence their prices are higher than ours and invariably rely on hand outs to put it in (due to the high excess construction costs). You mentioned Silchester, we took over the network there back in 2008 , it was a slow/unreliable wifi mesh network run by “village internet / EVIB” , the prior owner lives in Silchester and as far as i am aware is involved with INCA at present. We removed the existing network and replaced it with a new non wifi one and expanded its coverage. This was done at our cost of course. This network is small (~30 customers) and is not fed from a Data Centre like our other networks. This is why it offers lower speeds and capacities. Later this year we are looking to change the feed there to bring it into line with our other networks as part of planned expansion in the Basingstoke area. What we do first of course is down to where the demand is and if they are offering to pay for it. So Hampshire joins the list of disinterested parties such as West Sussex and Surrey. Counties such as Staffordshire and Derbyshire are showing a lot of interest in Kijoma’s solution and are looking to fund it for their communities. Not out of the BDUK money though as that seems to be excluding Fixed wireless providers. Many thanks for the explanation. A small but important grammatical point: I’m sure you mean West Sussex and Surrey are “uninterested”. What you wrote meant they are dispassionate judges without a dog in the fight, which I’m not sure is the case. Grammar is not my strong point 🙂 , i leave that to you writing types usually , i live in the realm of code and IP addresses here. Grammar is kept to a minimum. dispassionate judges… without a dog in the fight.. maybe more accurate than it seems.. I have sent you via email the WSCC map overlaid onto ours. Something i slapped together in paint shop which you may find of use. pfft, only in the top 3% of speeds in the country, shame!